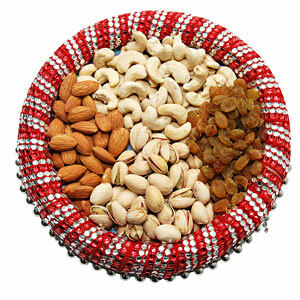 Convey your best wishes and regards to your dear ones in all cities in India by sending this Dry Fruit Thali to them. This Thali consists of 100 grams of Kaju, 100 grams of Almond, 100 grams of Raisin and 100gms Pista. The Thali itself is decorated nicely, which further enhances the entire look of the gift. Send this Thali to your loved ones through GiftsAcrossIndia.com and add joy to the auspicious occasion. You can also send other Gifts across India by choosing from our collection.